The Slave Biographies project is an open access repository of information on the identities of enslaved persons in the Atlantic World. As persons were bought and sold in the Atlantic slave trade, they left behind them a wealth of biographical data, including certificates of indenture, marriage records, birth records, estate sales, etc. As these records are assembled into a central database, it becomes possible to begin tracing the footsteps of individual slaves and uncovering information abut their ethnicity, family, skills, and history. Until recently, however, the records that would make this type of work possible were scattered in the basements and libraries of individual scholars and researchers across the globe. For the first time, the Slave Biographies project is bringing these records together and entering their data into a central digital repository. Using the KORA content management system to universalize the metadata format, over 100,000 records have been entered into the Slave Biographies database. Now, records are searchable across collections and record types. 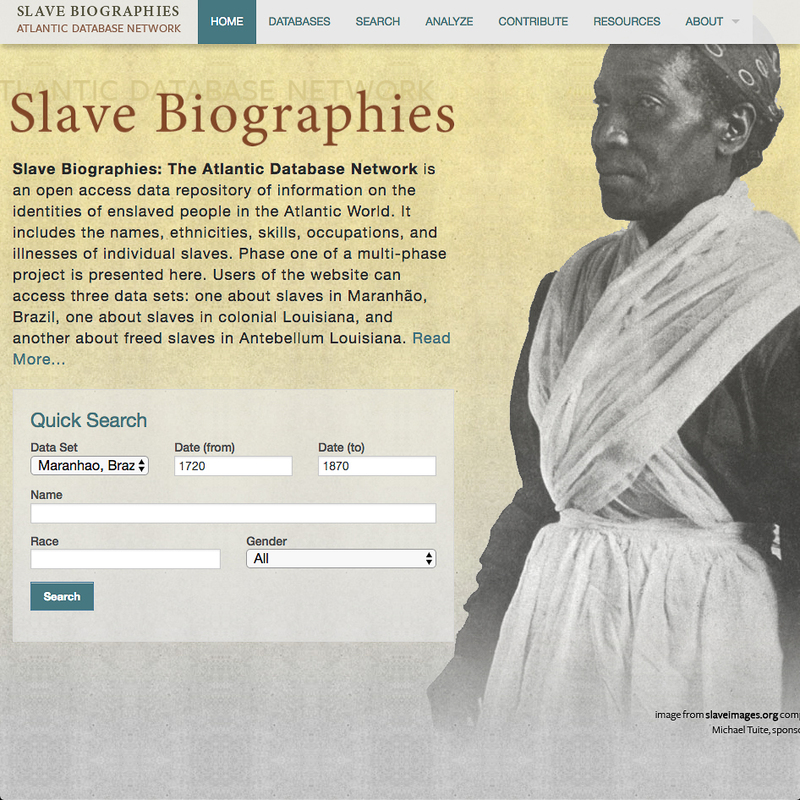 The Slave Biographies project is part of MATRIX’s larger commitment to rehumanizing big data. Although this database now allows for large-scale data visualizations that drawn from thousands of data sources, it can also be used to construct detailed biographies of individuals involved in the Atlantic slave trade. Slave Biographies allows users to toggle between “big picture” views of the Atlantic slave trade and detailed views of individual lives. This makes the Slave Biographies project an important resource both to scholars who are attempting to answer large-scale research questions about the Atlantic slave trade and also to persons of slave descent who are attempting to learn more about their enslaved ancestors. We encourage you to visit the Slave Biographies website and see what you can learn about the history of enslaved persons in the Atlantic.